Michigan has been in a rolling crisis since 2002 or so: the state has experienced the loss of manufacturing jobs, mortgage foreclosures, and plummeting state and municipal revenues at a pace that has left the region badly shaken. What have been some of the macro-level effects? How have population, income, employment, and housing changed since 2000? In particular, what effects has the recession had on southeast Michigan, where almost half of the state’s population lives? 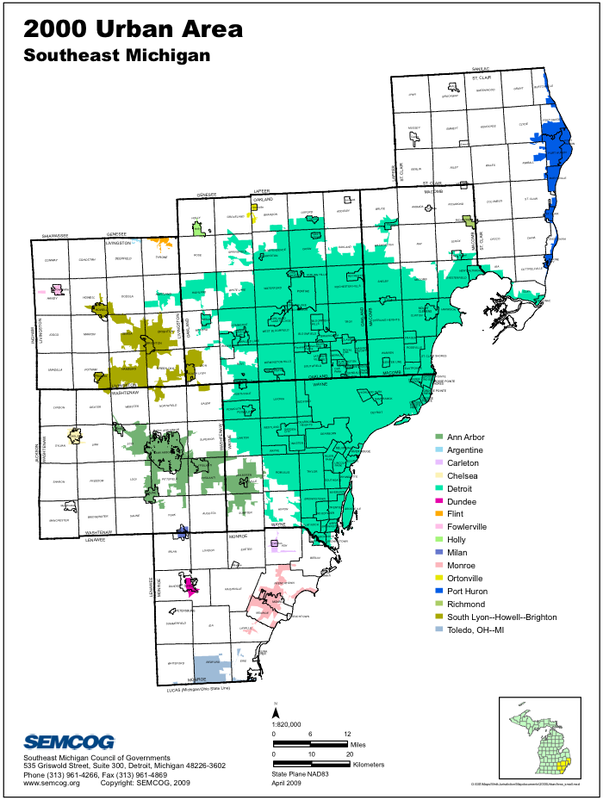 The Southeast Michigan Council of Governments (SEMCOG) has released a preliminary analysis of the data collected in the 2008 American Community Survey (a periodic resurvey conducted by the US Census Bureau; link). Some of the results are startling. Most dramatic is what has happened to income, but the region also shows important changes in residential occupancy, poverty rates, and unemployment. The report considers data for seven counties in southeast Michigan — Livingston, Macomb, Monroe, Oakland, St. Clair, Washtenaw, and Wayne. (This corresponds loosely to the definition of the Detroit Metropolitan Statistical Area, which consists of the six counties of Lapeer, Livingston, Macomb, Oakland, St. Clair, and Wayne.) The population of this region was 4.8 million in 2008, essentially unchanged since the 2000 census. So the region had not experienced significant net out-migration as of 2008 (post). But the age structure of the population has changed noticeably, from a median age of 35.2 in 2000 to a median age of 38.1 in 2008. The most striking change in this period is a dramatic drop in household and per capita income. In 2000 the median household income was $64,590, which fell to $54,184 in 2008 — a 16% decline in household income. And per capita income fell from $40,993 to $34,665 — a 15% decline in per capita income. This is a very large decline in a short time. The report also documents a wide income gap based on race. In 2008 median white household income was $63,183, whereas in black households it was $40,021 and in Hispanic households it was $44,548. White households were about 50% more affluent than black households. Both parts of these findings are important. The overall decline in personal and family income in eight years is quite remarkable; it certainly represents a very significant decline in the standard of living in the region as a result of recession-related job losses and wage cuts. And the racial disparities indicated by the gaps between white, black, and Hispanic households demonstrate the persistent racial disadvantages that seem to be hard-wired into the region. The decline in family income has other harmful consequences as well. The net purchasing power of the region dropped by a significant percentage — which translates into the loss of revenues for small businesses whose revenues depend on consumer purchases. And state revenues based on income taxes and sales taxes in the region fell as well by a comparable percentage — leading to a fiscal crisis for the state and for municipalities. Not surprisingly, the ACS data demonstrate that there was a significant upsurge in the poverty rate in the region between 2000 and 2008. In 2000 10.6% of the population lived below the poverty line; and in 2008, this group had risen to 13.9% — a 31% increase. The percentage of families with children in poverty rose from 11.5% to 15.7%, an even greater increase than in the general population. The effects of the foreclosure crisis are visible in this report as well. Changes in residential vacancy rates are an indicator of rising frequency of foreclosures. In 2000 there were 106,680 vacant housing units (5.5%). In 2008 this number had risen to 260,974 units (12.6%). This reflected large increases in both homeowner and rental vacancy rates over the time period. Another noteworthy feature of the report is the light it sheds on differences by county in some important variables across the region. Most striking is the percentage of adults with a college degree. The region as a whole has 28% of its adults with a bachelor’s degree or higher. And this number has increased from 25% in 2000. (At the other end of the spectrum, 12.4% of the adult population lacks a high school degree in 2008.) But this average masks a very wide range of college attainment rates by county, from a low of 13.9% in St. Clair County (the extreme northeast of the map above) to highs of 42.3% in Oakland County and 51.3% in Washtenaw County. Wayne County has a college completion rate of 19.5%. Also striking are the income differences across counties. Median household incomes ranged from a low of $42,376 (Wayne County) to a high of $71,486 (Livingston County). Washtenaw County (home of Ann Arbor and the University of Michigan) is somewhat anomalous: it has the highest percentage of college-educated adults, but its median household income is in the middle, at $57,848. Predictably, poverty rates varied across counties as well. Livingston County had the lowest poverty rate in 2008 (7.6%), while Wayne County had the highest poverty rate by a significant margin (20.1%). So a person in Wayne County had almost three times the likelihood of living in poverty as a person in Livingston County. Washtenaw County’s poverty rate is also surprisingly high, at 14.6%. Finally, it appears that the foreclosure crisis had differential impact across the region as well. Wayne County shows the highest residential vacancy rate in 2008 (17.9%), whereas Livingston, Macomb, Monroe, and Washtenaw Counties fall between 7.6% and 8.6%. 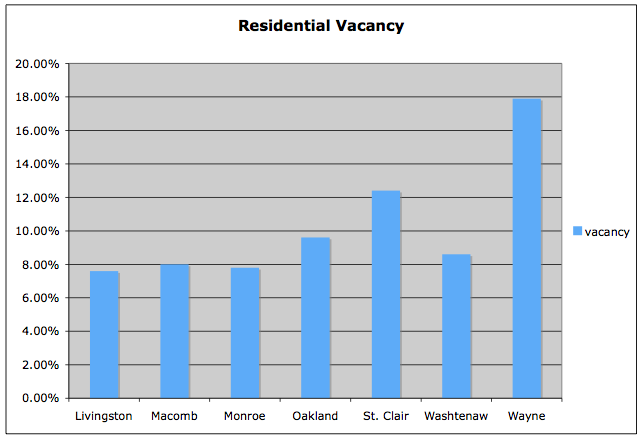 So the residential vacancy rate in Wayne County is at least double that of other parts of the region. This set of data from the 2008 American Community Survey sheds light on two very important facts. 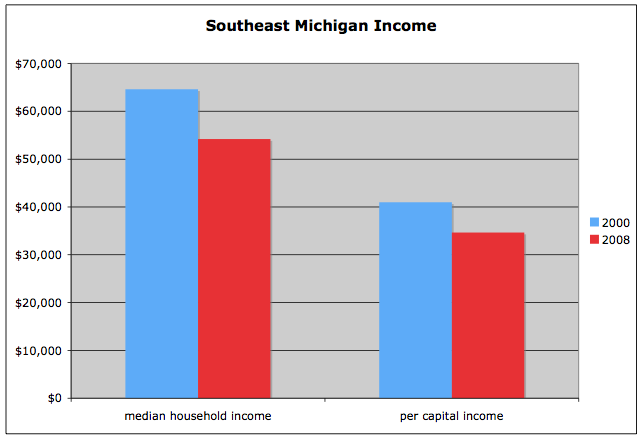 First, southeast Michigan has suffered deeply and rapidly as a result of the recession. The loss of jobs and shrinking of business activity resulted in rapid and sharp declines in family income; the recession greatly increased the number of home foreclosures; and it resulted in placing another 155,000 people in poverty — a 31% increase in the number of people in poverty. And second, the 2008 data demonstrate that these effects are not uniformly distributed across the region. Several counties weathered the recession relatively well. The worst effects have been experienced in Wayne County and the city of Detroit. And, given the degree of racial segregation that is demonstrated in Southeast Michigan, this implies that the recession had disproportionately harmful effects on the African-American population of the state.